It started off with a carefully worded soliloquy in Paris though US Secretary of State Hillary Clinton did not mean to keep her thoughts to herself. She lambasted Russia and China at the third Friends of Syria conference a few days ago, allegedly for blocking efforts to topple Syrian President Bashar Al Assad and his regime, calling on the 100-plus countries present to “make it clear that Russia and China will pay a price” for their intransigence. What are the consequences of these sharp condemnations? It was not long before a Chinese diplomatic spokesman responded with the claim that “China strongly upheld international law, and that it spared no efforts to bring forward lasting peace in the Middle East.” It further maintained that it was “mindful of the fundamental interests of the Syrian people,” without specifying what those were. It was worth recalling that the Geneva Declaration revealed no explicit demands for Al Assad to cede power as a prerequisite to resolve the conflict in a compromise accord. Rather, the consensus reached in Geneva hovered around the lack of pre-determined conditions to begin an all-Syrian dialogue that, presumably, would allow Syrians to chose their leader. That was why nearly everyone agreed to ask Kofi Annan, the former UN secretary-general and the joint UN-League of Arab States special envoy to Syria to return to Damascus for yet another round of negotiations with Al Assad. It was worth noting Annan was not in Geneva but, in a rare moment of candour, recognised that his mission to bring peace to the 16-month bloody conflict in Syria failed when he spoke with Le Monde. Still, Annan was tasked to try and convince Damascus to finally start the implementation of his six-point plan first announced on April 12. Miraculously, Annan settled on a framework with Al Assad on July 9, 2012, which he vowed to “share with the armed opposition”, though his first stop after the Damascus powwow was in Tehran. Slight in his remarks, the envoy described the two-hour meeting with Al Assad as “candid and constructive”, which meant the conversations were brutal and inconclusive. Before resuming his global tour, Annan said he “stressed the importance of moving ahead with a political dialogue” that, apparently, Al Assad accepted. Though it was unclear what political role Annan envisioned for Iran as he shared the results of the agreed upon “framework” with Iranian officials, news Moscow had suspended deliveries of arms and fighter planes to Syria until the situation stabilised indicated pressure had grown on Damascus even if Russia still held on to its sole remaining Arab ally. Annan hoped for the best while Al Assad insisted he would continue fighting “terrorists”, emphasising one had to fight terrorism because “you cannot keep just making dialogue while they are killing your people and your army”. The Syrian President further underscored that the US was a partner with terrorists and was providing “weapons, money or public and political support at the UN... They offer the umbrella and political support to those gangs to... destabilise Syria,” he opined, underscoring sharp differences with the Obama administration. As events on the ground illustrated, neither Washington nor Moscow managed to persuade Damascus to accept a ceasefire, pull its heavy weapons from residential areas and start the necessary political steps that could eventually allow Syrians to engage in dialogue that could decide the shape of a new political system. 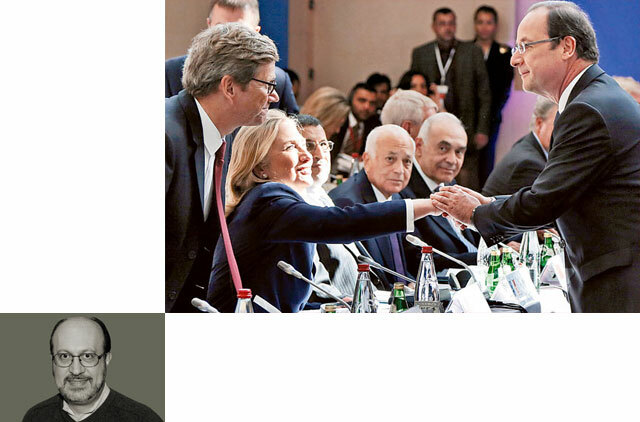 No matter how passionate Hillary Clinton was about Syria, she confronted an equally determined Russian counterpart, Sergei Lavrov, who delivered fervently pragmatic speeches to defend his country’s strategic interests in the region. As a consequence of this clash between the US and Russia, western powers have resorted to holding heartfelt conferences and delivering lofty promises, some of which border on the principle that the Al Assad regime must go, while others are peripheral at best, bargaining with humanitarian assistance from Turkey, Lebanon, Jordan and Iraq. Few mustered the courage to introduce a permanent ceasefire at the Security Council, and as long as Washington and Moscow fail to agree to bring the civil war to a stop, Syria is condemned to wallow in more or less permanent misery. Dr Joseph A. Kechichian is the author of the forthcoming Legal and Political Reforms in Saudi Arabia (Routledge, 2012).